He’s a young, low-ranking, art-loving member of the angelic hierarchy, and his name is Joe. In 1998 I “met” him while experimenting with using my less-dominant hand to write answers to the big questions I had about my life. Soon my left hand was channeling this loving, helpful, funny, sometimes painfully honest spirit as he explained his role (and mine) in the cosmic plan, offered daily support, and helped me to come into my own as an artist. 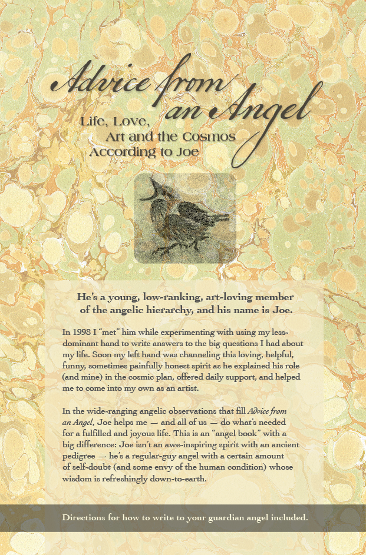 In the wide-ranging angelic observations that fill Advice from an Angel, Joe helps me — and all of us — do what’s needed for a fulfilled and joyous life. This is an “angel book” with a big difference: Joe isn’t an awe-inspiring spirit with an ancient pedigree — he’s a regular-guy angel with a certain amount of self-doubt (and some envy of the human condition) whose wisdom is refreshingly down-to-earth. 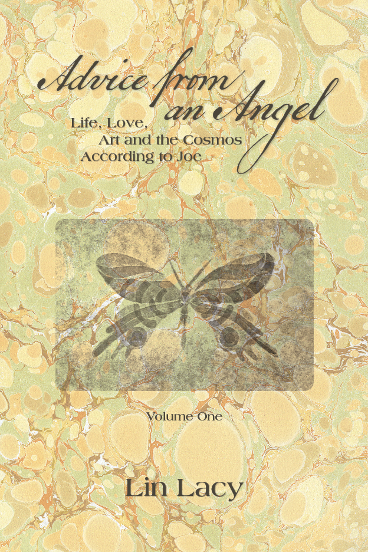 For more information about purchasing Lin's books and art, please contact her at Lin@LinLacy.com. To purchase Advice from an Angel, please order here.